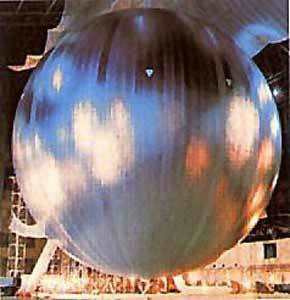 The Echo 2 spacecraft was a 41-m balloon of aluminum foil-mylar laminate. Echo 2 was designed as a rigidized passive communications spacecraft for testing propagation, tracking, and communication techniques. Instrumentation included a beacon telemetry system that provided a tracking signal, monitored spacecraft skin temperature between -120° C and +16° C, and measured the internal pressure of the spacecraft between 5E-5 mm of mercury and 0.5 mm of mercury, especially during the initial inflation stages. This system, which consisted of two beacon assemblies, used solar cell panels for power and had a minimum power output of 45 mW at 136.17 MHz and 136.02 MHz. Befor the orbital flight was made, two suborbital tests called Big Shot were made. Big Shot 1 failed, when the balloon ruptured during inflation. In addition to fulfilling its communications mission, the spacecraft was used for global geometric geodesy. The spacecraft re-entered the atmosphere on 7 June 1969.